There were 900 Syrian refugees on board the ship. ITALY’S COASTGUARD SAID today it had narrowly averted another high seas disaster by intercepting a freighter that was on a collision course with the country’s rocky shoreline with more than 900 Syrian refugees on board. 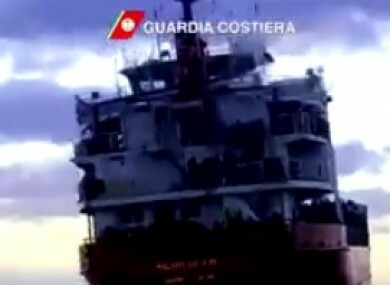 In what was the second maritime drama of recent days, officers revealed that the huge cargo ship’s engine had been locked on with the steering set on a direction that would have led to it crashing ashore somewhere in the Puglia region on the “heel” of Italy. The coastguard, already working flat out because of the Norman Atlantic ferry disaster, scrambled two helicopters overnight after realising that the Moldovan-registered Blue Sky M, was headed for disaster. Six coastguard officers boarded the vessel and, after some frantic moments on the bridge, were able to unlock the engines and bring the boat under control just five miles from the coast. In a tweet from its official account, the coastguard said a “massacre” had been avoided. The migrants on board, including a heavily pregnant woman whose waters broke during the drama, were taken to the port of Gallipoli as an inquest began into how the alarming incident had occurred. Greece’s coastguard had on Tuesday afternoon received a distress call from someone on board the Blue Sky M who reported that it was being navigated by heavily armed men. A navy frigate, a helicopter and two patrol vessels were dispatched to intercept the boat off the island of Corfu. But after what now appears to have been a very cursory check, the vessel was allowed to continue its journey. Italian officials suspect that the vessel was then under the control of people smugglers who later jumped ship, as they frequently do in the knowledge that their human cargo will be picked up by navy or merchant ships. One man suspected of involvement with the traffickers was arrested after the port arrived in Gallipoli. The drama came as Italy and Greece were coping with the aftermath of the Norman Atlantic disaster, which has left at least 13 people dead and dozens more unaccounted for. The Italian-owned, Greek-operated ferry was due to be towed today from waters off Albania back to Italy. The cause of a killer blaze that erupted on the ferry on Sunday remains unknown and investigations aimed at finding out what happened have been opened in Italy and Greece. Survivors who waited up to 24 hours to be rescued from the burning ship have highlighted major shortcomings in the crew’s response to the emergency. Doubts over the accuracy of the passenger list have hampered attempts to establish the true scale of the tragedy. The prosecutor in charge of the Italian investigation has said he expects to find more bodies aboard the burnt-out ferry, which was carrying an unknown number of stowaways and more than 400 passengers and crew. Three stowaways who were rescued, two Afghans and a Syrian, have requested political asylum. It is feared some passengers may have died in cabins that were engulfed in smoke early in the incident. An unknown number reported by witnesses to have made it into a lifeboat have not been accounted for. Italy’s coastguard has vast experience in rescuing boat people fleeing conflict or poverty in the Middle East, Africa and Asia. More than 170,000 have landed in Italy this year and hundreds, possibly thousands, more have perished at sea while attempting the crossing. With the onset of winter, traffickers have switched to using bigger boats like the Blue Sky M, rather than the converted fishing boats and dinghies they previously deployed. Email “Runaway ship with 900 refugees on board stopped from striking Italian coast”. Feedback on “Runaway ship with 900 refugees on board stopped from striking Italian coast”.